So it’s a bit of a double tragedy out there tonight. Travis d’Arnaud surrendering his favorite uni number — one he earned while Jose Reyes was drawing gigantic checks from a franchise that traded d’Arnaud away — and the Mets bending over backwards to accommodate a disgraced star when there’s no guarantee he’s anything approaching the No. 7 he once was. Travis for his part robotically blurted out unconvincing platitudes about Reyes and Peyton Manning, and here is is, wearing his third uni number in as many years. They couldn’t even do the right thing and use this unusual situation to re-introduce No. 8 to the uni-sphere. In an attempt to add more offense the Mets on Thursday recalled Robinson Cancel, the chubby hero of a few of 2008’s most inspiring victories, and designated Elmer Dessens for assignment. Strangely, the Mets issued Cancel No. 29, even though the No. 40 he’d worn most recently was available (he’d worn 40 after first receiving 4, then seeing the Mets re-issue that number toArgenis Reyes. Cancel however wore 4 again this spring only to see the Mets issue that number twice this year (to Wilson Valdez and now Angel Berroa). At any rate, No. 29 grants Cancel entry into the exclusive Three-Number Club whose membership is listed below. As for Dessens, he didn’t pitch so badly while not buried in the pen, and so barely had an impact other than having become the team’s first ever No. 64. I had a short panic attack the other day worried that Omar Minaya would attempt to rehabilitate his mangled image by making a large and unnecessary trade at the deadline for Roy Halladay (32 is available, you know) but that’s mostly subsided. How about an actual hitter though? Keith Olbermann appears to have received our information on near-Met Wilbur Huckle. In his latest post, Keith quotes the article we posted and reveals that the roster obtained by his photographer friend includes Huckle’s name written in pencil and identified as wearing No. 24 — a jersey that would have been available in September of 1963. He also follows up with details of the New Breed’s push for Huckle’s presidential candidacy in 1964. A shout-out for MBTN and Jason? Nope. Reader Edward in the meantime reminds us that Darryl Strawberry and a pitcher — he cannot recall who — were similarly invited to spend time with the 1982 Mets at season’s end. Keith’s blog has been added to the “Good at Baseball” links to the left. 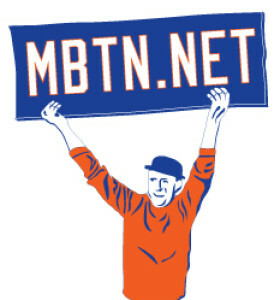 To the Mets links, I’ve added those of beat writers Adam Rubin of the Daily News and David Lennon of Newsday — two guys who work incredibly hard so that other bloggers have links to aggregate every day. The print press is getting killed and the Internet is a great thing but to me there’s nothing like getting my hands all inky with the Snooze every morning. At 50 cents a day it’s an ideal commute killer and a bargain too. Read the papers. The Mets appear to have shut down their online survey on their uniforms — hopefully not before you, like me, submitted a few dozen responses. Don’t think I’ve come across anyone who’s a big fan of the black anymore but I sense the hatred among the prototypes in the survey was strongest for the vest which, I’m just gonna say, I don’t think is so bad provided you’re resigned to the inevitability of an alternate, which I am. But you know what I really hate and they didn’t even ask about? Those two-tone helmets. My, they’re awful. Anyway, I’d give a week’s pay to be the guy to summarize the survey findings for Jeff. We weren’t even finished with the press events around the Mets by the Numbers book last spring when my co-writer Matt Silverman was at work on two new projects. One was Cubs by the Numbers (I know, right?) done with the same editor at Skyhorse and with Kasey Ignarskiwho’d been tracking Cubs numbers for at least as long as I’d been doing Mets numbers here (also Al Yellon, at the Bleed Cubbie Blue blog). If you happen to have a friend who’s a Cubs fan, consider buying them this as a gift. I’ve added Ramon Martinez to the list of Mets who’ve worn three numbers as published on theJeff McKnight page. Now can we get rid of the guy already? Forgive me but it was hard to notice until last night that Carlos Beltran 15 was back. He was of course; he returned from the disabled list on Friday, while Marlon Anderson 23 hit the bereavement list. Last night, Anderson was back and David Newhan 17 was again sent to the minors top make room. Newly named coach Howard Johnson was spied at Spring Training revealing jersey No. 52 and temporarily ending some wild speculation that he’d finagle his old No. 20 from Shawn Green. The rules of the jersey game clearly pointed to this outcome — coaches don’t take jerseys from players, except when the player happens to be someone like Jeff McKnight. Then, all bets are off. Thanks to readers Gene and Matt for pointing it out. Also worth noting: Coach Jerry Manuel is back in No. 53, with spring training invitee Aaron Sele in 35. Manuel, you may recall, was assigned 53 last spring but switched jerseys when Chad Bradford — who’d been assigned 35 — preferred the latter. This restores at least some orderliness on the coaching bench: Sandy Alomar Sr. is still waddling around in No. 2, but the rest of the staff are nice and Rube Walkerly in the 50s — Rick Peterson 51; Hojo 52; Manuel 53; Rick Down 54; Tom Nieto 55; and Guy Conti 56. Other sightings at Spring Training, as reported by various witnesses: Carlos Gomez in 88 and Fernando Martinez in 67. There have been several photos of recently signed ancient catcher Sandy Alomar Jr. floating around the Met but none in a jersey we’ve seen yet. Let us know if find something. The bill will be compensation for the uniform No. 18, which Valentin surrendered to Alou. Valentin has changed to No. 22 — worn previously by Ray Knight, Donn Clendenon, Kevin McReynolds, Al Leiter and Xavier Nady, among others — to accommodate Alou. Except for his first two games with the Pirates in 1990, when he wore No. 52, Alou has worn No. 18 throughout his career. Alou’s uncle, Jesus, wore No. 23 with the Mets in 1975. Mike Piazza’s punishment for his attempted assault of cowardly Dodger pitcher Guillermo Mota has created the potential for third-string backstop Jason Phillips cracking the roster in the early going. Should Phillips see action, it would be while wearing his third “official” different uniform number as a Met and his 4th overall: Quite an accomplishment for a guy with only 26 Major-League at-bats! 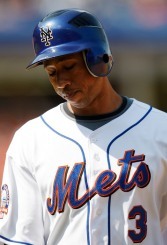 To explain: Phillips was called up to Mets in May of 2001 and issued a jersey — No. 3 — but did not appear in a game before being sent back to AA Binghamton. Later that year Phillips made his “official” Met debut in No. 26 — his No. 3 had in the meantime been issued to Vance Wilson. Twenty-six was issued to Marco Scutaro prior to Phillips’ September call-up of 2002 so Phillips instead wore No. 7. This spring, the Mets dressed superstar-in-waiting Jose Reyes in No. 7 and told Phillips to take No. 23, which would be his likely number the next time he appears as a Met. The Goggled One still has two more uni-switches ahead of him if he wants to catch all-time uni-number leader Jeff McKnight but he’s off to a great start!